Ever since humans have been living in society by some codes and standards we've tried to brush up on our sense of justice. Most agree that in a perfect world, justice is dispensed equally and without discrimination so that all may get what they deserve. Needless to say, we'll probably never reach that Nirvana, but we can certainly try... and that's exactly what Sebastian Rudd dedicates his life to in John Grisham's latest legal thriller, Rogue Lawyer. Outer space is something that forever has and most likely will continue to hold our attention and fuel our imagination. After all, it is a grandiose world of unimaginable proportions and unthinkable processes that gives way to just about every scenario the human mind can come up with, and more. There is nothing like going past the frontier and being the one to push space exploration to new horizons, to find another piece of the universal puzzle. Though our technology still has ways to go until we can actually make the trip, very few things can contain the power of the mind: John Sandford and Ctein take us into deep space in Saturn Run. Throughout our history, we humans have come face-to-face with incalculable amounts of unexplained phenomena, and more often than not our inability to make sense of things led us to create explanations we could somehow make sense of. Thankfully though, the scientific minds amongst us have never stopped working in the right direction, and since the scientific oppression more or less ended we've been busy making discoveries and providing real answers to the questions that nagged us for years, if not decades or even centuries. However, as we found ways to explain various things our views on the subjects changed, allowing us to develop more accurate worldviews which allow us to better understand and interact with our reality. Pam Grout is someone who came up with her own worldview, and in E-Cubed she takes us deeper into it than before. As much as we would like for wars to end when the conquered surrender and peace treaties are signed, the truth is that the spirit of conflict floats over the people for months, if not for years after. This was true for World War II as well; though the Nazi government may have been vanquished, it left a lot of living Nazis behind, people who had committed atrocities and seeking to start anew... a chance they got in America. Eric Lichtbau has decided to write an entire book about the subject, which he titled The Nazis Next Door. From A to Z, this book is dedicated to the covert immigration that happened after WWII ended, when countless Nazis made their way to America in hopes of starting a new and quiet life, on a clean slate, free from all the atrocities and war crimes they committed. Needless to say, there are many who managed to slip in through the cracks, passing themselves off as European refugees... after all, there were more than enough of those around to blend in successfully. However, there are some other Nazis who received a bit of help in getting across the pond... help from the United States government itself. We've gotten rather used to the concept of there being popular figures and their fans. Most people make whoever's work they truly enjoy a part of their life... but there are some who start basing their lives around it, and worse, around the artist him/herself. The fear of crazy and dangerously-obsessed fans has no doubt plagued virtually everyone who had a brush with fame, and in his new novel Finders Keepers , Stephen King once again plays on it masterfully. It seems that for one reason or another war veterans don't fare all that well in the world of literature. More often than not they are traumatized by what they've experienced, are alcoholics, down-on-their-luck, with the whole wide world pressing down against them. And yet they make for some of the best heroes, the unlikeliest of underdogs who go against the grain regardless of whether or not they will end up winning. In The Guise of Another by Allen Eskens we have the pleasure of following Alexander Rupert, that kind of war veteran, on a rather strange path to redemption. Great day to everyone, and welcome back once again for what is the 80th issue of Gliding Over the World of Literature, where we work tirelessly to bring the latest news from the domain of books to your computer screens! Today, we will kick things off by checking out new upcoming books dedicated to analyzing all known portraits of Frederick Douglass and Sojourner Truth. Following that, we'll examine the curious case of the man who invents languages. Finally, we'll cap things off with the question: do our children still need to be taught literary classics? No matter how much hatred one holds for the Nazis, there is no denying that they were at the peak of the mountain in terms of technological research. That is to say, they had some of the most brilliant scientific minds the world had ever seen working for the Third Reich. After the Second World War came to an end the winning countries had to decide what to do with those people, and that's when the United States put in motion the operation that would secretly bring over those Nazi scientists, putting them to work on American soil, for American interests. Annie Jacobsen has written an entire book about the whole thing, titled Operation Paperclip. Small, peaceful and loving communities are about as disarming an environment as one could hope to find; after all, how could anyone have trouble in paradise? Well, as it turns out, in the world of literature paradise is the perfect place for things to go sour, and that's precisely what happens in A. J. Banner's first novel, The Good Neighbor. 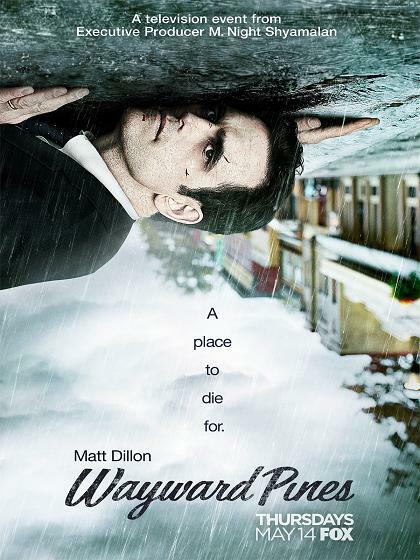 This past summer a ten-episode show graced our televisions, called Wayward Pines. It earned a whole lot of critical acclaim, being the most-watched show in its running time, and sent a lot of people investigating on its source. Lo and behold, it was all based on a trilogy of books, called the Wayward Pines Series , written by Blake Crouch, with the first book which kicks off the strange adventure being appropriately-titled Pines. With the kind of security the President of the United States benefits from today, it would be hard to imagine someone succeeding in an assassination. No resources are spared in ensuring the safety of arguably the country's most important person, whether it be intelligence investigations, armoured cars, or security agents. However, looking back on America's history, it seems that assassinating presidents was dangerously close to becoming a viable hobby, with assassins having taken the lives of Lincoln, Kennedy... and nearly that of Ronald Reagan.